This "double cluster," NGC 1850, is located in the Large Magellanic Cloud. In this amazing space wallpaper, a "double cluster," NGC 1850, is located in the Large Magellanic Cloud. 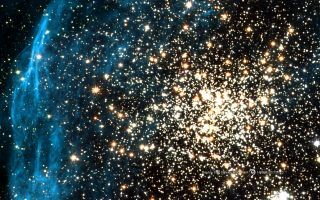 It consists of a large cluster of stars, located near a smaller cluster (below and to the right). The large cluster is 50 million years old; the other only 4 million years old. The cluster is surrounded by gas believed to be created by the explosion of massive stars.